Google Photos has become one of the most popular digital media sharing tool. In addition to sharing, Google Photos can backup your mobile phone photos and provides the strongest automatic organization and search capabilities of all the competition. However, is Google Photos right for you? And how do you get started with Google Photos? What can Google Photos do for you? First off, remember that Google Photos is a tool. And as such, it has specific purposes that it was built for. Like with any tool, if your expectations do not match the intent of the tool you will be frustrated and disappointed. For example, Google Photos has some automatic organization by date, but if you are trying to use Google Photos to organize your photo folders, it will not work. Google Photos is a great tool…but for the right tasks. So what can Google Photos help you with? Google Photos can store your photos in the cloud so they are accessible from all your devices. This means that once you upload your digital pictures to Google Photos, you can access them from your computers phones and tablets. This is pretty cool. However, any cloud storage offers this feature. And when it comes to storage space, Google Photos shines again because it offers unlimited space as long as you store compressed jpeg photos. Google Photos allows you to automatically store your mobile and desktop photos so you don’t have to worry about uploading them to the service. This feature is called automatic backup. Most cloud storage services offer this as well. Microsoft OneDrive, Apple iCloud and Yahoo!’s Flickr all after mobile media backup. Google Photos allows you to share the media content you have uploaded whether manually or automatically. This is also common. 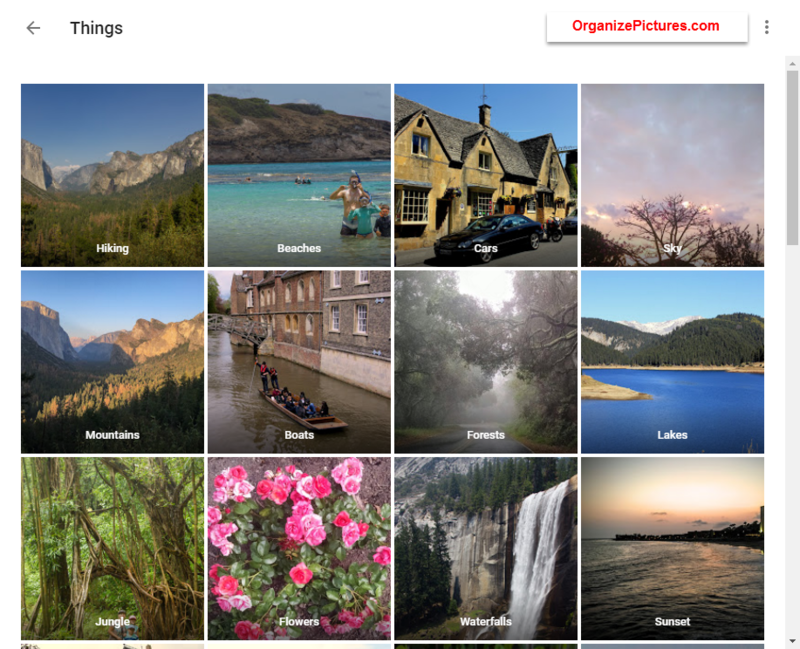 Google Photos allows you to group the uploaded photos into logical groups called albums. This his way you can share only certain groups of photos. This is very handy but common as well. Google Photos allows you to search by date, faces and objects in the pictures. This last feature is what differentiates Google Photos from any other cloud storage provider. Google’s powerful image analysis algorithm can recognize animals, beaches, sunsets, mountains, bridges, castles and a lot of other objects. This is simply amazing and very useful. So, what do you want to use Google Photos for? With the risk of becoming annoying I will remind you again that Google Photos is just a tool that helps you achieve some of your goals for your digital media library. Based on what Google Photos can do, what are your goals? This is a very important question you have to ask with any tool you are using including Google Photos. What are you trying to achieve with Google Photos? Maybe it is backing up your media collection in the cloud so you have an extra backup. Maybe it is to share your favorite photos or maybe it is both. Or you simply want to try it out and figure out what your goals are. Even though you don’t have an answer yet, asking this question is very important with any tool you are using. 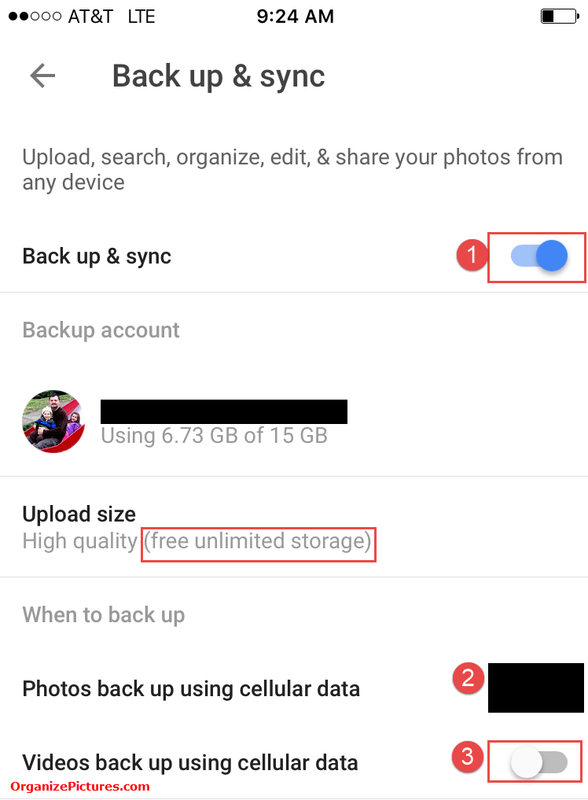 For me, since I backup my entire computer on an inexpensive and reliable external hard drive and in the cloud with Backblaze, backing up my pictures is not one of my goals for Google Photos. I only use Google Photos only to share my favorite photos with family and friends. So think about why you want to use Google Photos. The actual physical storage of your digital pictures in Google Photos is done using your Google Drive account, so there are a few useful Google Drive settings for actually seeing your Google Photos storage in Google Drive. Once you setup your Google Drive to store your photos, a new folder will appear inside your My Drive root folder. The folder is simply called “Google Photos”. That’s where all your Google Photos pictures are stored. In addition, all your pictures are further organized by year with all the photos taken during 2015 for example being grouped in the 2015 folder. This is pretty handy especially as a physical backup of your photos. 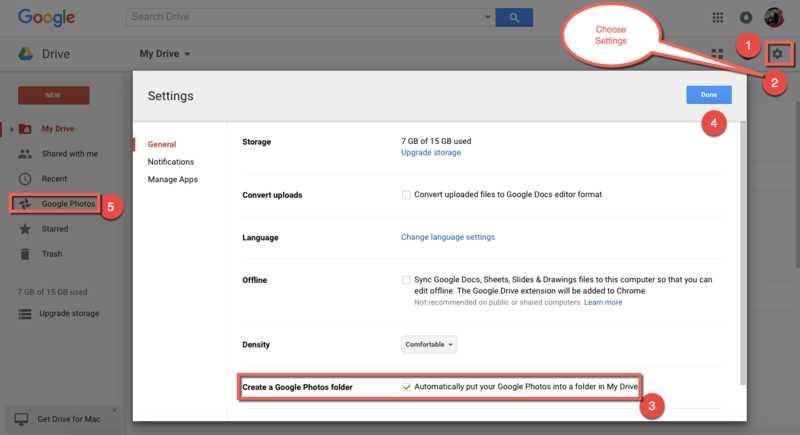 Read more about linking your Google Drive to Google Photos. 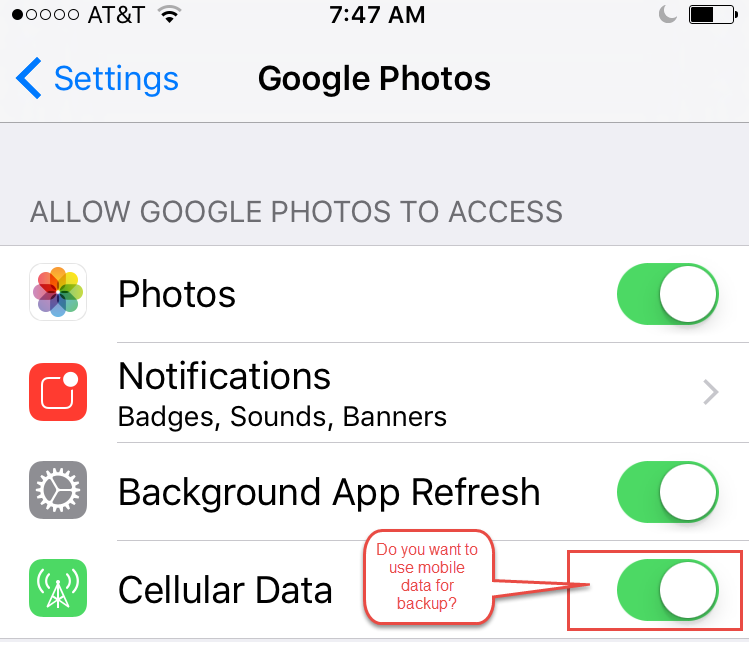 If you determined to use Google Photos for backing up your smartphone photos (which I do NOT recommend), then just download and install the Google Photos app and turn the automatic backup on. It will work as expected…in most cases. If you do not wish to backup your phone photos automatically (I recommend you do not backup automatically) then don’t turn it on. On Apple’s iOS devices however, like my iPhone 6s, things are not as smooth. This is to be expected since Google Photos is not made by Apple. It turns out that the automatic backup doesn’t run unless you open the Google Photos app and keep it running. Apple’s iOS operating system restricts background processes for any application not in the Apple eco-system. So if you close Google Photos on your iPhone, then the backup stops working. One really important drawback of automatic backup of your mobile photos is having multiple copies of your pictures. This always results in duplicate pictures all over the place. My basic rule for dealing with duplicate pictures is to always import only once from any device and place the photos on my main photo library device. In addition, once imported I always delete the pictures from that device. This way there is only one copy of all my pictures on my desktop. All the other platforms, including Google Photos, are for sharing pictures. They don’t hold pictures that are not in my main library. This is also the reason why I use Google Backup and Sync to synchronize selected photos on my Desktop with Google Photos. This way I configure Google Backup and Sync to upload only my EXPORT folder, so only the selected family pictures are actually uploaded to Google Photos for easy sharing. In addition, if anything happens to my Google Photos account, all the photos are safe on my Desktop and my external hard drive and my Backblaze cloud backup. My main goal for using Google Photos is to share my digital photos with friends and family. I also use its awesome search feature, face recognition and location mapping, but my main purpose is to share my favorite pictures. I prefer Google Photos over Facebook because of the great control I have over what I share. I only upload favorite pictures to Google Photos and I group them in albums. Then I create a shareable link that I send out only to the people I want to use it. This way I control exactly who sees my photos. Another great way to share your pictures from Google Photos is to use the Chromecast stick to project them on a TV screen. This works great from any smartphone using the Chromecast app or Google Chrome web browser. We are really enjoying this feature. How should you use Google Photos? Well…it depends on what you want to accomplish. If you want a simple way to backup your mobile photos, then turn on automatic backup. You just need to deal with all these duplicate pictures all over the place. If sharing is your goals, Google Photos is as simple and powerful as they get…I love it! The bottom line is that you can start using Google Photos and then turn off features you do not use. All in all, Google Photos is my favorite application for sharing photos. These are free and have awesome unique features. Try them out! I totally agree with your workflow and way to use a “photo hub” vs Google Photos. It would, however, be nice to somehow be able to add information about the pictures online – through GP – while viewing the photos. Both yourself and people with whom you’ve shared photos. In GP it’s possible to add comments to shared albums, but these are nor stored in the IPTC tags of the photo on GD nor copied back to the originals in your photo hub. Getting photos enriched with metadata is a challenging task, but also extremely crucial, as the metadata tell the “story” behind the picture – which is almost more valuable than the photo itself, when it comes to family photos. It should be possible to add metadata as part of the photo viewing experience, and both I and my family members (and others with whom I share my photos) should be able to add metadata in a user-friendly manner – metadata which are added to the original photos in my hub. This would, of course, require some kind of sync mechanism, going the opposite way of your workflow, but it would anyhow be very nice, I think. Do you get my point? Have you thought of a way to accomplish this? Peter…you are right…it is only through social media sites that you can gather image comments from friends and family. You can however gather all these comments and use an IPTC editor to insert them all in the captions field so all the comments stay with the image.